Observation - Fungi - UK and Ireland. 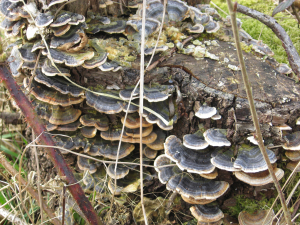 Description: Liked these fungi, as they reminded me of mussels on a rock. Growing on a dead stump, not sure what tree. Any ideas? Liked these fungi, as they reminded me of mussels on a rock. Growing on a dead stump, not sure what tree. Any ideas?